Cast: Jackie Chan, Jet Li, Michael Angarano, Yifei Liu, Collin Chou. Story: Kung fu kid visits fantasy fighty world. Oh my god, it's a movie of that Monkey TV series from the 70s! Well, it is and it isn't. 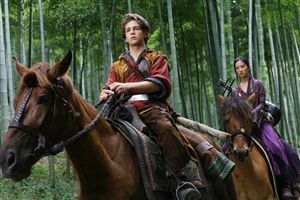 "The Monkey King," is clearly the same character, and the kid from the real world (Michael Angarano from Sky High) who gets sucked into their fantasy world is called Tripitikas (in Monkey the monk was Tripitaka), but in reality they're both just adapted from the same epic Eastern story "Journey to the West". Jet Li is the cheeky simian monarch, and he's absolutely superb at it - gone are the days when he just stared woodenly throughout a movie, he's an accomplished performer nowadays. Jackie Chan joins in as a fighter spookily similar to his 1978 Drunken Master and he can still hoik his 54 year old bones around like a mere slip of a lad. Unfortunately they've used the silly flying technique born in Crouching Tiger, Hidden Dragon and perpetuated through Hero, Curse of the Golden Flower and so on. It really is crap. I'm quite happy with the axiom that these characters can leap about like fleas, but when they're dangling from a wire it doesn't look like they're leaping about like fleas, it looks like they're dangling from a wire. It simply doesn't work. Plot-wise there's nothing new. The story feels very 80s - you'll be reminded of The Karate Kid more than once and there are no surprises to be had anywhere along the way. There's one laugh-out-loud moment (when Jackie Chan tries to make it rain) and the special effects and backdrops are all very pretty. It's an unashamed old-school martial arts adventure with some modern tricks thrown in, and it achieves everything it sets out to do. It's just not very ambitious in that respect. The Forbidden Kingdom takes you back to the days of watching Monkey on telly and looking forward to seeing The Goonies and The Golden Child at the cinema. It's harmless fun, you could do a lot worse. Testosterone Satisfaction Rating: 3/5 - there's a fight every couple of minutes but they're a bit silly. To enjoy this film you should be: nostalgic about the 80s. The Forbidden Kingdom was released in the UK on 9th July 2008.